So we (Heiko, DG1BHA, was assisting) did some deeper investigations into the power supply itself and soon found the culprit: a small IC had burned and blasted away it’s top, see on the photo below the big transformer! 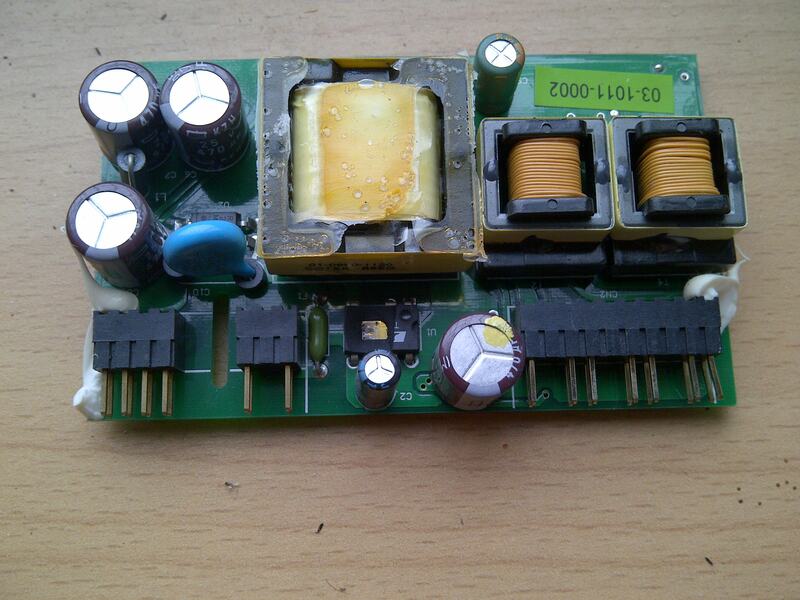 Luckily we could still find the top inside the enclosure and identify the IC as a TNY280PN. It’s application notes on the web helped to understand what the circuit was good for and what else needed to be checked. Besides the TNY280PN an optocoupler as well as 2 diodes failed, too. Ordered new components and the rest is history now, since Thursday last week (just one day after the UA3 tropo ended, damn!) the OM1002 is working again, total repair cost less than 10 EUR. 😎 Many thanks to Heiko who soldered in the TNY280PN and put it all together again locally with me 700 km away just giving instructions. 😉 Hope it will hold a bit longer now. This entry was posted in Contesting, Equipment, Propagation, Tropo, VHF. Bookmark the permalink.